Wolfgang Winter is an artist. The Frankfurter Kunstverein invited Frankfurt based artist duo Wolfgang Winter and Berthold Hörbelt to create the site-specific installation „Die Große Illusion“ (The Grand Illusion) on the occasion of the celebration of the new old town. The sculpture—specially designed for the exterior of what is now the oldest house in the new Altstadt—overlooks the new Dom Römer neighborhood and will be publicly accessible to the area’s visitors for half a year. Artists Winter/Hörbelt are internationally known for their projects in public space, which make use of industrial materials and methods. Their artistic works refer back to and consciously seek to alter the viewer’s perceptions of the respective surroundings in which they are installed. The artist team—working together for twenty-five years—has shown their work at events including the Venice Biennale, the Skulpturprojekte Münster, the Yokohama Triennale, and the Liverpool Biennale. Moreover, they have realized over eighty works in public spaces worldwide. These include two large pieces in a newly landscaped park at the University of Cambridge as well as projects here in the region such as the accessible, large-scale sculpture Der Blaue Kran (The Blue Crane) at the Offenbach Port and the eighteen meter high wall relief Vertieft-Erhaben (Deepened Sublime) at the Zentrales Verwaltungsgebäude (central administration building) of the city of Frankfurt. 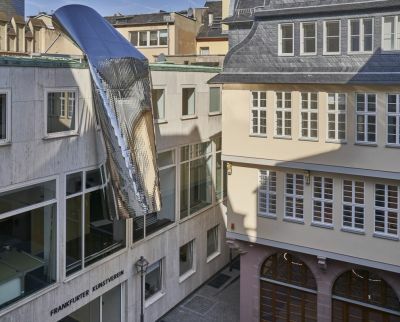 For the sculpture „Die Große Illusion“ on the exterior of the Frankfurter Kunstverein’s building, Winter/Hörbelt use polished steel plates, which underwent a process of folding and overlapping that creates a shimmering effect. With its reflective surface, the two ton form achieves a sense of weightlessness, dissolving the outline of the sculpture and opening it up to its surroundings. The pixelated shell creates ever new fragmentary images of what stands around it. The traditionally modernist sculpture forms an exciting counterpoint to the romanticism of the historically oriented neighborhood. The sculpture’s reflection dissolves the Altstadt’s reconstructed facades. A collage of different perspectives emerges, constantly changing with the movement of the passerby and time of day. The reflected realities lose their truthful character and break down into disconcerting refractions, rendering one’s perception illusory. The newly constructed Altstadt with its desire for identity and security dissolves once again. The sculpture is nine meters long, has a diameter of two and a half meters, consists of highly polished, one-and-a-half millimeter thick steel sheets, and weighs two tons. The elaborate installation on the building of the Frankfurter Kunstverein will begin on September 18. The sculpture will be transported to Römerberg with a twenty-one meter low-bed truck and lifted onto the building of the Frankfurter Kunstverein with cranes. It will then be affixed to the roof over the course of a multi-day installation process.